Published in Nov/Dec 2012 issue of Ceramic Review. One Saturday morning, I got a text message saying ‘Richard Deacon at Lisson. Ceramics. Last day.You should see it.’ I had an hour to spare and the gallery was only a short train ride away so I went. I had seen Deacon’s work before: large forms made from bent and stretched wood or metal that evoked for me a sense of volume, expansion, and a feeling of movement created by the relationship between the structure and the interior hollow of the sculptures. But I wasn’t familiar with his ceramic work and what I encountered befuddled me because it didn’t evoke anything I was expecting of Deacon’s work. I scrabbled around trying to make sense of the associations posed by the objects. Were the plinth objects (‘Republic’) architectural forms that should be bigger or were they oversized pick-up-sticks? Was I being presented a scrap pile of rods or an allusion to bars of precious metal carefully arranged? Further inside the gallery, Deacon’s large green sculpture (‘Fold’) posed even more questions. Was it a wall or a tower perhaps? I wasn’t sure. The segments that made up each column certainly functioned like bricks. However these were glazed bricks of deep industrial green that reminded me of the architectural ceramics of imperial China or maybe the Victorian tiles used in municipal buildings. After a quick look round, I texted my friend back, ‘Interesting work but I don’t think I got it’. 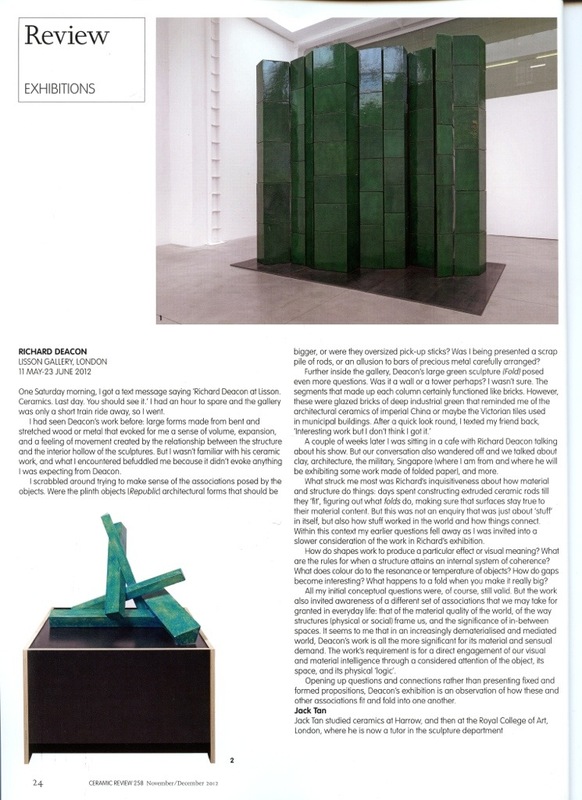 A couple of weeks later I was sitting in a cafe with Richard Deacon talking about his show. But our conversation also wandered off and we talked about clay, architecture, the military, Singapore (where I am from and where he is exhibiting next some work made of folded paper) and more. What struck me most was Richard’s inquisitiveness about how material and structure do things: days spent constructing extruded ceramic rods till they ‘fit’, figuring out what folds do, making sure that surfaces stay true to their material content. But this was not an enquiry that was just about ‘stuff’ in itself but also how stuff worked in the world and how things connect. Within this context my earlier questions fell away as I was invited into a slower consideration of the work in Richard’s exhibition. How do shapes work to produce a particular effect or visual meaning? What are the rules for when a structure attains an internal system of coherence? What does colour do to the resonance or temperature of objects? How do gaps become interesting? What happens to a fold when you make it really big? All my initial conceptual questions were of course still valid. But the work also invited awareness of a different set of associations that we may take for granted in everyday life: that of the material quality of the world, of the way structures (physical or social) frame us, and the significance of in-between spaces. It seems to me that in an increasingly dematerialised and mediated world, Deacon’s work is all the more significant for its material and sensual demand. The work’s requirement is for a direct engagement of our visual and material intelligence through a considered attention of the object, its space and its physical ‘logic’. Opening up questions and connections rather than presenting fixed and formed propositions, Deacon’s exhibition is an observation of how these and other associations fit and fold into one another.